Having penned 28 Days Later and Sunshine, Alex Garland was well equipped to write and stun with his directorial debut and instant sci-fi classic Ex Machina. 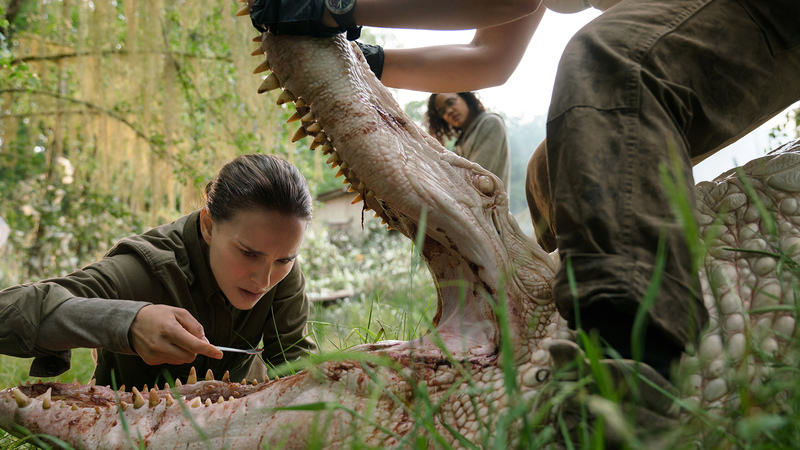 Based on Jeff VanderMeer’s novel of the same name, writer-director Garland’s ambitious follow-up Annihilation sees him return to his realm of science fiction, this time with a hint of horror. Academic biologist and former soldier Lena (Natalie Portman) is overwhelmed when her serving husband Kane (Oscar Isaac), who is presumed dead, returns from a mysterious military mission after a year. Astonishment soon gives way to panic as Kane fails to recall where he’s been and soon after is taken seriously ill. While in the ambulance, the pair are intercepted and taken to “Area X” which is situated near an enigmatic phenomenon known as “the shimmer”. Psychologist Dr Ventress (Jennifer Jason Leigh) reveals to Lena that this is where her husband’s unit was sent and that no one except Kane (who’s now in a coma) has returned. Ventress goes on to explain all that’s known of the shimmer is that it began with a meteor striking a lighthouse and it’s been expanding for three years, soon to engulf entire cities, states and beyond. Instead of assigning yet another team, Ventress intends on leading the next crew and recruits Lena, who accepts, desperate to possibly find answers that may save her husband. Completing the team are physicist Josie Radeck (Tessa Thompson), geomorphologist Cass Sheppard (Tuva Novotny) and paramedic Anya Thorensen (Gina Rodriguez). As the troop enter the dome-like shimmer, they’re encased and confined in a skewed dimension, where amnesia and paranoia soon take hold. Resulting in a fractured group dynamic that’s reminiscent of John Carpenter’s The Thing. Another striking resemblance to the 1982 sci-fi horror classic reveals itself as the women soon discover the shimmer’s ability to modify organisms. Spreading like a disease but instead of destroying cells, transforming them. An alligator/shark hybrid stalks and Twin Peaks-esque doppelgängers are born. The deeper the crew explore, the darker their findings become. Human remains merge with surroundings, growing up walls like an unruly plant, with decaying body parts that abruptly jut out but lead to an oddly beautiful bouquet of colour. A found memory card reveals Cronenberg-style body horror and in the most horrifying scene in recent memory, a mutated bear mimics the dying screams of its last victim, while hunting for its next. Annihilation’s initial set-up is similar to 2016’s Arrival, with a presumed alien presence appearing on earth and swiftly being investigated. The film then veers into a survival and escape horror similar to 2005’s The Descent, which also boasted an all-female cast and a depth to their plight. During its finale, Annihilation treads into 2001: A Space Odyssey territory. Dazzling with kaleidoscopic visuals and raising thought-provoking questions, but refusing to provide any easy answers. There are also shades of Andrei Tarkovsky echoing throughout. From lovers inexplicably returning, paired with the glistening similarities of the shimmer and the luminous waters in Solaris. To the exploration of human consciousness and behaviour that floods his body of work. Rob Hardy’s cinematography draws your eye to minute details that illustrate the film’s many themes. Fusions are portrayed through water droplets on a glass meeting and becoming one, sliding doors glide into a union and limbs entwine during intimate embraces. Hardy also frames a central strand of duality by stepping back in awe of the shimmer’s beauty and showcasing its bite with claustrophobic close-ups. Likewise, Geoff Barrow and Ben Salisbury’s score begins with earthy acoustic strings that surrender to haunting synthy sci-fi tones. Annihilation’s leading ladies are intelligent and flawed. Proving that compelling female characters don’t necessarily need to be all-conquering superheroes like Wonder Woman and they certainly don’t need to be featured in a rehash of a male-centric franchise like 2016’s Ghostbusters. Each woman is fighting her own personal battle, consumed by grief, disease, addiction and depression. However, instead of needing to be consoled, cured, rehabilitated or counselled, the shimmer has other plans for them. Rather than their inevitable self-destruction in the outside world, their vessels are destined to be repurposed. Each actress has enough time to shine as we peer into each of their respective character’s personalities. With their findings having poignant implications for Lena, the film focuses on her quest. Portman is stern but inquisitive and understanding, attributes drawn from Lena’s varied occupations. Flashbacks to happier memories of marriage drift throughout and showcase a grounded, tender and playful bond, bolstered by a palpable chemistry between Portman and Isaac. In a far smaller role compared to his intimidating turn in Ex Machina, Isaac remains predictably brilliant, even with an unfortunate lack of dancing this time around. A lethal combination of film studio Paramount wanting to butcher Annihilation’s final act in the name of accessibility. Along with poor box office numbers across the pond, led to the film being unceremoniously discarded on Netflix internationally. Garland expressed his disappointment by stating “we made the film for cinema”, but acknowledged the benefits of a far-reaching small screen medium. While every frame of Annihilation screams to be viewed on the big screen. The compromise of streaming, without the studio suggested alterations, allows the film-maker’s faith in viewer’s intelligence to remain intact. So we’re not lumbered with another dumbed-down, forgettable flick that fails to offer an alternative to what already currently bloats multiplexes. 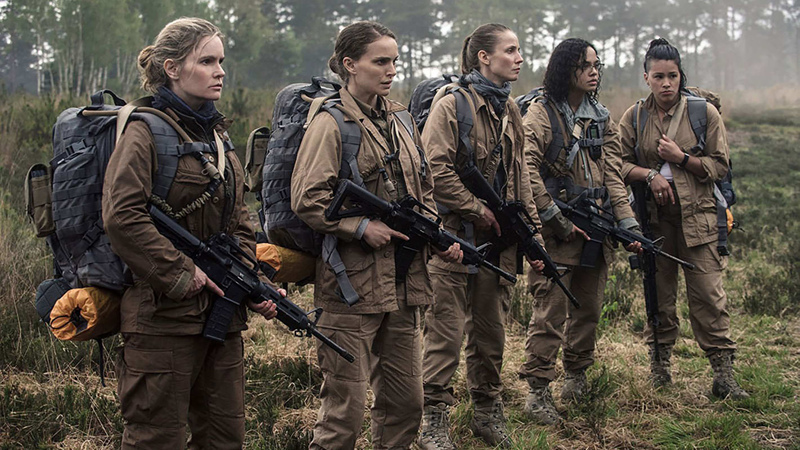 It’s odd that a film as daring as Annihilation, that also organically showcases women and minorities, passes by without the fanfare that now surrounds repetitive, heavy-handed blockbusters, that have been dragged into the 21st-century with their casting choices. Annihilation’s big ideas burst from its small screen confines, with Alex Garland fast becoming a name that’s synonymous with science fiction.